Quick Summary: 5K Formula System is an affiliate marketing program that provides the tools and services that an affiliate needs. Matthew Neer claims to help you earn a massive amount using a sales funnel system he has personally designed. 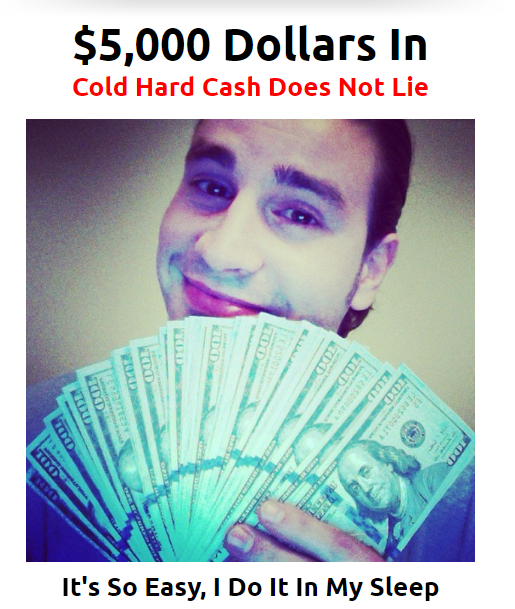 Even without skills and experience, you can convert traffic into cash using his program but how true are these claims? Can you really make money using his program while you sleep? The advancement in technology and the internet has made a lot of things possible nowadays, such as earning money online. Even at the comforts of your own home, a few clicks, and little experience, you can create a source of income, and its amount and stability depend on the number of hours you’re willing to spend and the task you’re willing to complete. That being said, your effort and time play a vital role in your success online. However, there are many programs claiming that you can make money -- a massive amount of cash -- in less than an hour, doing almost nothing. They make it sound convincing and interesting as much as possible and although there are a lot of red flags involved, a lot of people still fall for their trap. Today’s post is about a program designed by Matthew Neer, a well-known internet marketer who has engineered 5K Formula System. Despite the good reputation he built in his chosen industry, there are still a lot of loopholes found in his program which I’ll gladly discuss in a bit. For now, let’s get to know what it’s about and if 5K Formula System is a scam. 5K Formula System is an affiliate marketing platform that provides necessary tools and services for affiliate marketing. It’s been founded by Matthew Neer, a reputable internet marketer who has also created another similar system called Income League. Unlike other ClickBank products, Matthew has revealed his real identity and divulged as much information as he can about the system. According to him, he has discovered a “high converting sales funnel” that converts into cash. He even said that this system has made things easy, he can even earn money while he sleeps. Apparently, you can use the same system on autopilot, a pre-made sales funnel, when promoting products to earn commissions. It works like this: the said system will drive traffic to your website or a landing page where visitors can see sales pitch in the hope of encouraging them to purchase an item using your link. If conversion happens, that’s when you will start earning rewards a.k.a. commissions. The same system will provide all the ads, offers, and even follow-ups you need for a successful sale. First of all, I want to commend him for being transparent about his identity. He has used his real name and shown photos of his face and even of his partner and it’s something new to me. You see, most ClickBank products, although legit, are low quality and useless. Perhaps, this is the reason why the real founders are scared of divulging their information to the extent of using pen names simply because they don’t want anyone to reach them. On Matthew’s case, he seems proud and confident about his products. Matthew Neer is a well-respected marketer and you can see more of him on his YouTube account. According to him, the 5K Formula System allowed him to travel, eat, and sleep, while earning a massive amount. The reason behind opening this system to other people is to help him scale it up to a million dollars while allowing you to earn up to 100% of the commission. And although it sounds too good to be true, Matthew admitted that if you get rich, he’ll get richer, which for me, sounds fair enough. I almost believed that this program is really valuable until I found a number of red flags that I’ll be sharing in a bit. 5K Formula System is not a scam. In fact, Matthew Neer has done a good job explaining how his system works in terms of affiliate marketing. However, it still claims to be a quick way to earn income without putting enough effort since you’ll be using a done-for-you method. Plus, he said that he made it sound like he is using “secret methods”. Affiliate marketing and a sales funnel are not really secret methods. In fact, affiliate marketing is a legitimate way to earn money online that’s been known for quite a long time now. On the other hand, a good sales funnel has been used by many marketers to create a good source of income. While 5K Formulate System has taken extra steps to excel from his usual ClickBank competitors, I still can’t recommend this program. This is just my opinion: honestly, I don’t believe in such things. Even multi-millionaires believe that, in able to create a reliable source of income, you need to work hard. There’s no such thing as quick cash or instant money, like what Matthew Neer is claiming. On top of this, an autopilot system will not benefit you in the long run because first of all, you are limited. You can only use whatever it is that’s available in the system and if that’s been shut down, that only means one thing: your source of income will shut down, too. On 5K Formulate System’s home page, they are selling the program for only $39.99 if you join TODAY. However, I know that I’ll be getting the same “discounted price” even if I visit their site tomorrow or the next day or even the next month. If you think this is the only amount you’ll be paying for, think again. Like other low-quality products found online, you’ll meet a handful of upsells before having access to the product itself. Once you’ve spent around $495 (worth of upsells and downsells), you can enter the member’s area and see pre-made landing pages, training tools like webinars, campaigns, etc. To know more about 5K Formula System, you can watch the video below. 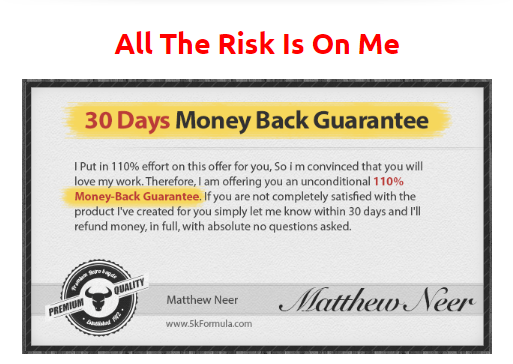 Matthew is very confident about his product that he said he’s offering a 110% money-back guarantee in case you’re not fully satisfied. Perhaps, this is the only thing I like about the program. Imagine, you started paying for $40 thinking that it’s the only payment you’ll give; however, before even reaching the program, you’ll end up paying for almost $500. This is a huge amount considering that the training he has in this system can be easily found on YouTube. If you want value for your time, effort, and money, you should consider my top recommended program. It’s also an affiliate marketing platform but the difference, you can start learning and earning for FREE. How is it free if you’re talking about the budget? 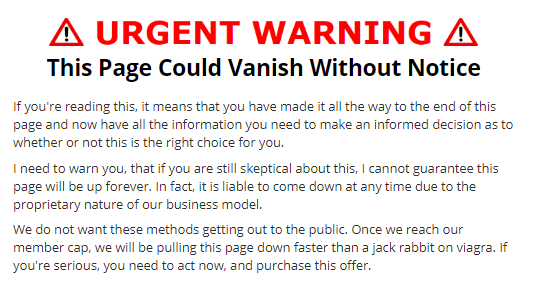 Another claims, which I believe is a red flag, is their “Urgent Warning” that says: This Page Could Vanish Without Notice. I mean, why would you tell that in the first place? If this is your business, your source of income, why would you allow it to disappear and not be seen by the potential market? Although pre-made squeeze pages, sales ad, and email messages made the tasks sound a lot easier, I don’t like it all. First, your creativity will be limited. You’ll not be tempted to go outside the box and create these things on your own. This also means that you can’t add your personal touch because the system you are using is limited. 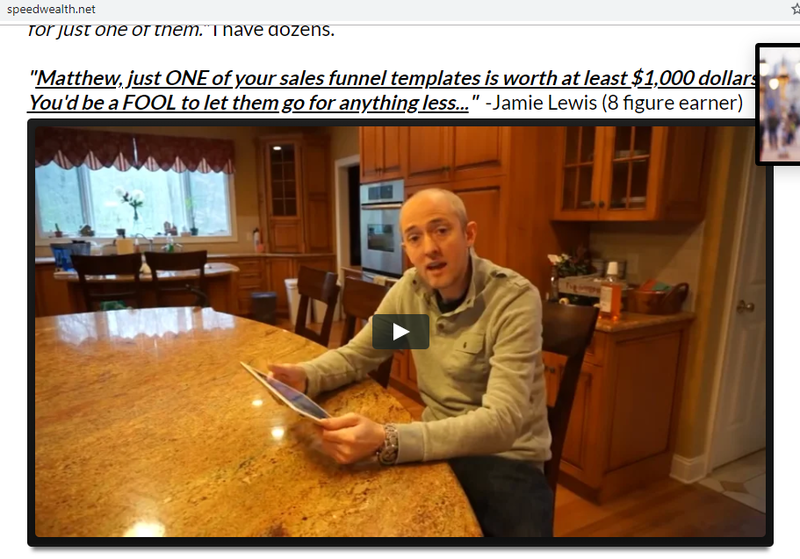 On 5K Formula System’s website, one of Matthew’s “millionaire partners”, Jamie Lewis, said that his sales funnel template was worth over a thousand dollars. If it’s really valuable, I think that’s not a problem. However, the same statement and video were used on another program named Speed Wealth System founded by no other than Matthew again. So, how can we trust that his sales funnel is really worth trying if it seems like the owner’s lying? 5K Formula System promotes itself like a very easy to do method because the owner says that you’ll be using pre-made templates to earn money; however, at the bottom part of the page, it says that the program is not applicable to average purchasers. This means that if you’re a beginner or you’re still learning the ins an outs of affiliate marketing, the system might not work for you. I doubt it would even work to anyone anyway. In my own humble opinion, I cannot recommend 5K Formula System to anyone because of the expensive upsells, false claims, and other misleading details. For the training tools, Matthew Neer has provided video tutorials that are more helpful to newbies rather than those who have been doing affiliate marketing for a long time. There are also webinars provided; however, not all members have access to it unless they have upgraded to a higher membership level which clearly suggests that Matthew is only after your money. If I were, I will get rid of this program at all cost and join an affiliate marketing platform that offers free membership and training, such as Wealthy Affiliate. Signing up for a free account is advantageous as it will allow you to explore the whole system to know whether it’s worth your time and money. 5K Formula System is not a scam. 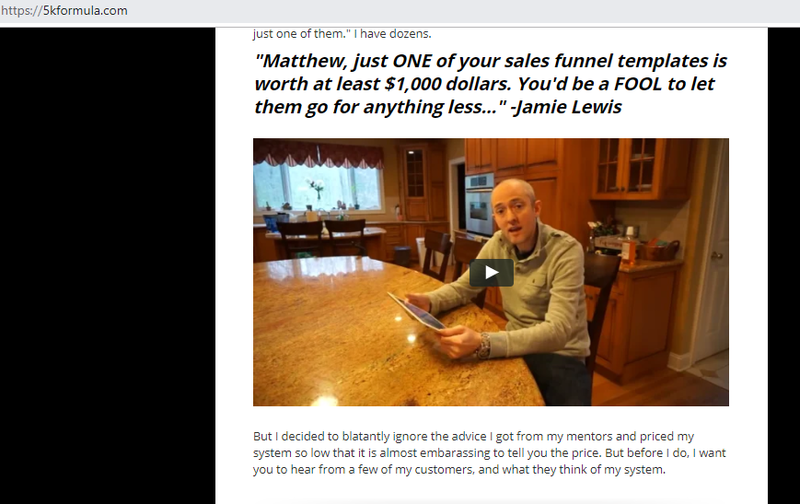 It is 100% legit and Matthew has offered valuable information for beginners, but then again, as his site suggests, it’s not for average purchasers so it won’t really benefit newbies and seasoned marketers. Some of the best things in life are free, and this program will show you why, and if you have any questions or comments, please feel free to drop it down below.